Organizers of the 1911 Amendment 8 campaign gathered in San Francisco for a publicity shot. 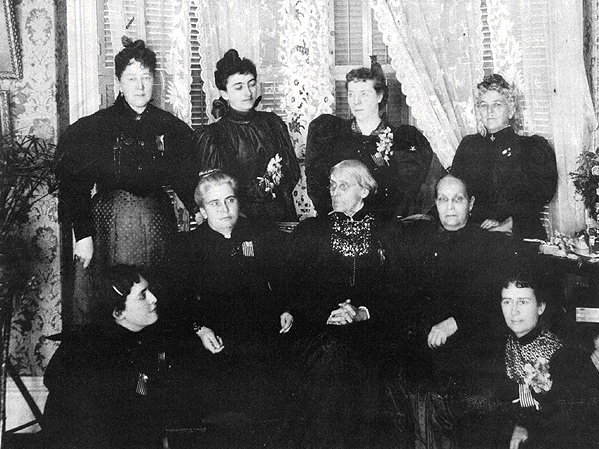 1896 meeting of Suffragist leaders: standing (l to r) Ida Husted Harper, Selena Solomons, Carrie Chapman Catt, Anne Bidwell, (seated) Lucy Anthony, Dr. Anna H. Shaw, Susan B. Anthony, Ellen Clark Sargent, and Mary Hay. American women gained their right to vote in 1920. But in California, women had already won the right to vote in 1911, nearly a decade earlier. 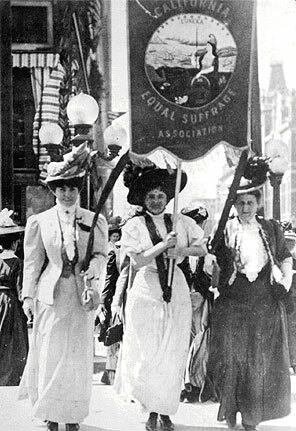 The 1896 and 1911 suffrage campaigns demonstrated the mature political savvy women had acquired. 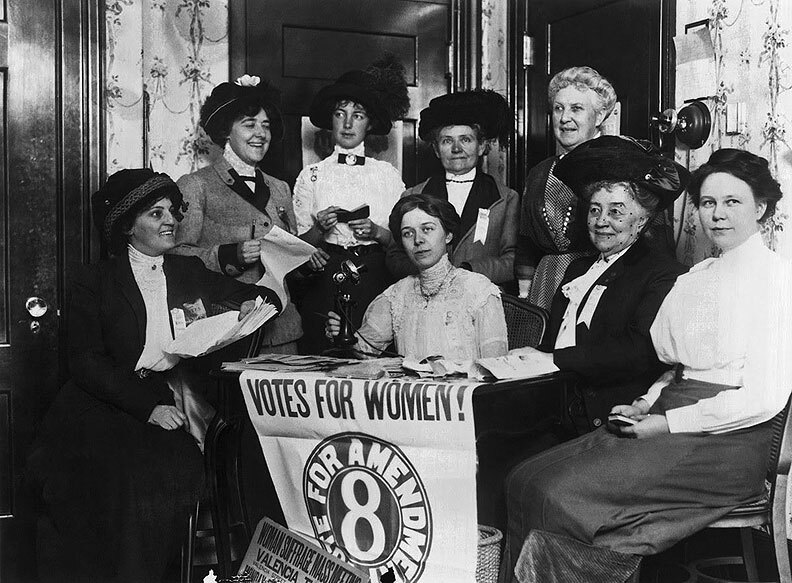 Both campaigns drew help from suffragists all over America, but the assistance to the 1911 effort was formidable. Women remembered who defeated them in 1896. Out of all the California counties, two killed the suffrage attempt in 1896--San Francisco and Alameda. The Liquor Dealers League, really the producers, proprietors and patrons of drink, defeated suffrage. Between 1896 and 1906, the movement languished in California as across America. But, after the earthquake in 1906, a suffrage convention of considerable size convened in San Francisco. The fight was on. The strategy would aim hard at the state's small towns and Southern California. Aided by the automobile and telephone, north and south suffragists merged to form an impressive campaign machine. The work was intense and highly individual. Church to church, school to school, club to club, door to door, person to person; all received handbills and newspaper articles about the suffrage movement. Little towns where nobody ever saw a suffragist learned about women's rights and the importance of the right to vote. The College Equal Suffrage League staged unique publicity events, often using their "Blue Liner," a special touring car. The night before the election, the famed Madame Nordica, in town for ground-breaking for the Panama-Pacific Exposition, unexpectedly appeared in Union Square. She entreated all to give women liberty--the vote. Nordica closed by singing "The Star Spangled Banner" to the cheers of the assembled crowd. Leading a march of 300 women of the California Equal Suffrage Association in Oakland August 27 1908 were (l to r) Lilllian Harris Coffin, Mrs. Theodore Pinther, Jr. and Mrs. Theodore Pinther, Sr.
Brief dramatization by Haight Ashbury Community Radio of Women's suffrage activism. The next day, October 10, 1911, suffragist precinct workers geared for fraud and mayhem at the ballot boxes in San Francisco and Alameda counties. An impressive corps of ballot box watchers, 1,066 men and women, scrutinized every voting poll in San Francisco. Watchers tallied at least 3,000 fraudulent ballots. The day after the election, City newspapers declared the California women's franchise vote dead. As anticipated, S.F. county voted 35,471 No; 21,912 Yes. Alameda voted 7,818 No; 6,075 Yes. 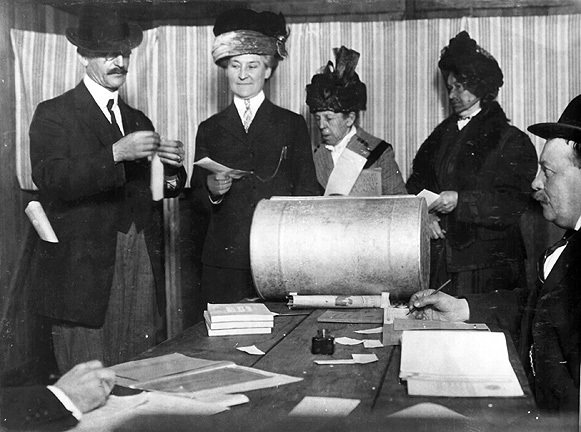 But suffrage workers smiled when the other votes started to roll in. Slowly they came, as they had been sought. The small towns and valleys delivered the victorious votes that returned a majority of 3,587. In 1911, California women joined the franchised women of Wyoming, Colorado, Utah, Idaho and Washington. In 1912, Oregon, Kansas and Arizona women won their vote. West coast women claimed their franchise. The potential power of that vote did not go unnoticed. March 28, 1912 heralded an historic first action for the women of California: This was the first time in their lives they could vote! L to R: Elizabeth Gerberding, Mary Sperry, and Nellie Eyester pose for the camera. SF Voter Registrar Zemansky appointed women to fill one half the number of precinct positions. In those nine Western states resided six and one-half million women voters. That translated into 45 electoral votes. In 1916, Alice Paul, Chair of the Washington, D.C. Committee of the National American Woman Suffrage Association, created the National Women's Party (NWP), a political party with only one agenda--the passage of the Susan B. Anthony 19th Amendment. NWP boasted 50,000 members, and raised three-quarters of a million dollars. Masterly and persistently, Paul executed her resolve, sending NWP members to be the first women in history to picket the White House. Carrie Chapman Catt, head of the National Association, engineered an incredibly complex and effective machine throughout the United States. Paul used "the young are at the gates" confrontational methods while Catt brokered adroitly in rooms dominated by either tea or cigars. Because of both drives, President Woodrow Wilson finally surrendered his support on behalf of the women's suffrage cause. After Congress passed the proposal on June 4,1919, each state had to ratify the amendment. Some state legislatures offered continued resistance, This was not the case in California. On Nov. 1, 1919, Governor William D. Stephens called a special session of the legislature to ratify the Nineteenth Amendment. Before the vote more than one-hundred members of the state suffrage association hosted a luncheon honoring the entire legislature, the governor and other executives. California ratified the Susan B. Anthony Amendment with little contention. The hour of the woman had arrived.